Who gets credit, and who takes credit, for changing the world? July 1, 1858 was a modest news day in mid-19th century London. Thirty-nine year old Queen Victoria went horseback riding, Madame Tussaud announced a wax image of United States President James Buchanan, and the steamship North Star arrived from New York in eleven days and six hours, a new record. 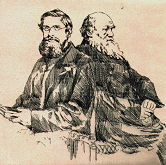 That cool evening members of the London’s august Linnean Society on Piccadilly heard two unpublished fragments about evolution written by the famous naturalist Charles Darwin, and a fully thought-out paper written by relative unknown Alfred Russel Wallace. Neither Darwin nor Wallace was present. Darwin stayed at his home in England mourning the death of a son to scarlet fever; Wallace was in distant New Guinea chasing butterflies and beetles. To simplify a complex story, as a result of Wallace’s paper, Charles Darwin was pushed to complete Origin of Species, which was published in 1859. No doubt we will see a media blitz in 2009 when the world will celebrate the 150th anniversary of the publication of Darwin’s bestseller (which will also be the 200th anniversary of Darwin’s birth); perhaps similar to the visibility given in 2005 to the 100th anniversary of Einstein’s “Miracle Year”, during which Einstein published his special theory of relativity. Alfred Russel Wallace, who was unaware that his paper had even been presented to the Linnean Society, continued collecting and writing about biogeography, island biology, changing sea levels and anthropology of the Malay archipelago, a region where he spent eight productive, but isolated years. Darwin, a member of the British scientific elite, became a household name; Wallace, who left school at 14 and came from a modest family, ended up as a (rather important) footnote in history. Historians and conspiracy theorists debate whether it was Wallace or Darwin who first conceived the concept of natural selection. Some researchers argue that it was scientific coincidence — that both men had their eureka moments independently. Such an occurrence is not uncommon; it’s called a “multiple”: Newton and Leibniz both discovered calculus. Oxygen was discovered by Carl Wilhelm Scheel in 1773 and by Joseph Priestly in1774. Color photography was invented almost simultaneously by two Frenchmen. Four independent researchers discovered sunspots, all in 1611. Six men invented the thermometer and nine invented the telescope. And so on. Nevertheless, a small but vocal group of Friends of Alfred suggest that Wallace came up with the key to evolution. And that Darwin stole it from him. Did Darwin plagiarize Wallace? The question can be addressed in both legal, and anecdotal terms. British lawyer David Hallmark, who is a trustee of the Wallacea Foundation based in Indonesia, notes that as Darwin had not previously published and as the letter from Wallace stimulated publication it follows that Wallace was first and Darwin, whatever he wrote, was second. Also, Hallmark adds, when Darwin did publish he failed to attribute to Wallace the impact of the younger man’s Ternate letter on his own works, yet Darwin used the Wallace theory as his own. Therein lies the prima facie case of plagiarism. There is circumstantial evidence that Darwin knew he had wronged Wallace and felt guilty about his actions. So, on this anniversary I ponder ethics and history. I do not know for certain whether Darwin plagiarized Wallace. What I do know for certain is this. First, the theory of evolution changed forever the way we view ourselves and our place in the universe. It was one of mankind’s great intellectual leaps forward.